CHAM is proud to announce the organisation of its IV International Conference on Innovation, Invention and Memory in Africa. Following very successful previous editions we are now focusing on Africa, its heritage, challenges and achievements. As a leading centre in the Humanities, CHAM aims in this edition to foster the presentation and discussion of multiple disciplinary approaches and contributions to the understanding of cultural, literary, historical, social, educational, artistic, ecological, and political landscapes in Africa. The conference will bring together students, academics, policymakers, community leaders, artists. It will promote a broad disciplinary approach to African Studies and a dynamic forum for discussion and knowledge production. A particular attention will be dedicated to the importance of future leaderships and to the role of young policymakers, researchers and artists. Read more about the conference concept. Please note that the working language of the conference is English. Presentations may be delivered in Portuguese, although proposals (titles/abstracts) should be presented in English, and consideration given to the global audience. 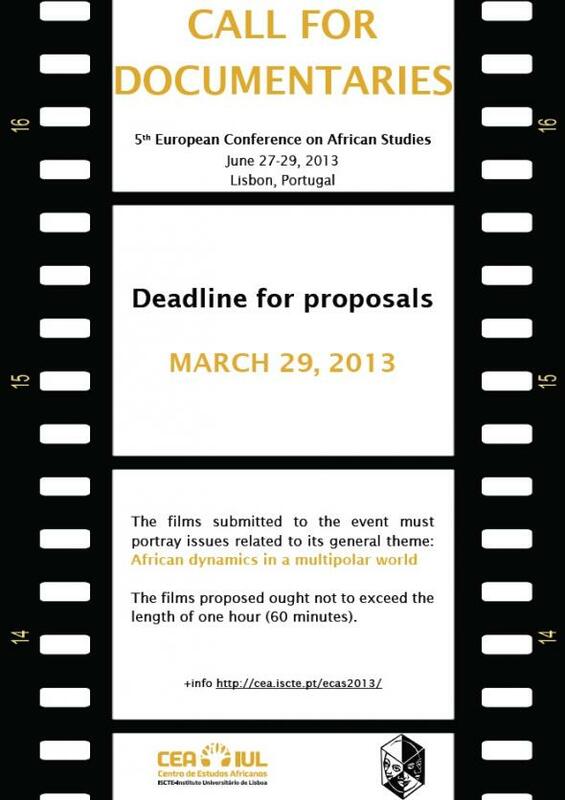 The 5th European Conference on African Studies (ECAS 2013) will take place between June 27 and 29, 2013, at ISCTE-IUL, in Lisbon, Portugal. In addition to the thematic panels and the keynote speeches, the conference will host a documentary film festival. The films submitted to the event must portray issues related to its general theme: African dynamics in a multipolar world. We strongly advise that the films submitted are spoken or subtitled in English, given the fact that the conference will gather academics from different nationalities and linguistic backgrounds. Moreover, the films proposed ought not to exceed the length of one hour (60 minutes). The deadline is on March 29, 2013. The documentaries can be submitted online via weTransfer (www.wetransfer.com) to the following e-mail address: joao.carlos.dias@iscte.pt, oreleonora.silva.rocha@iscte.pt. In contemporary Europe, we are witnessing the vanishing of anti-racism from political cultures and academic discourses, in favour of an approach that intervenes on immigrants and minorities themselves via public rhetoric on integration. This conference will thus bring together an international community engaging in debates on racism and anti-racism to discuss the analytical approaches and main findings of the European research project TOLERACE - The semantics of tolerance and (anti-)racism in Europe: public bodies and civil society in comparative perspective, coordinated by the Centre for Social Studies. The debate will focus on key issues that bring about an in-depth analysis of racism and anti-racism, such as the historical legacies of national formation processes and colonialism, contemporary political developments in European contexts, and the role of academia and social organisations in policy advice. 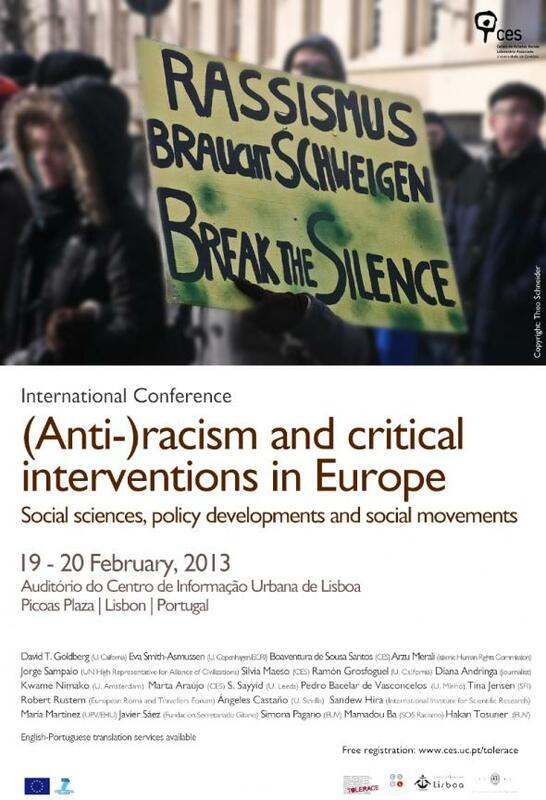 The event is intended as an opportunity to engage with policymakers, academics, political activists, journalists and stakeholders at local, national and European levels, discussing the difficulties of addressing racism in contemporary European contexts, as well as to propose a way forward by identifying approaches and key areas in which a sound debate on anti-racism can be constructed. Chair: Maria Paula Meneses (Centro de Estudos Sociais). Keynote address: Jorge Sampaio (UN High Representative for Alliance of Civilizations). Chair: Frank Peter (European University Viadrina/U. of Bern). Eva Smith-Asmussen (U. of Copenhagen/ECRI) and Robert Rustem (European Roma and Travellers Forum). Hakan Tosuner (European University Viadrina, Frankfurt): “Female Victims - Male Perpetrators. Representation of the Muslim ‘other’ in the German media”. Comments: Nadia Fadil (University of Leuven). Ramón Grosfoguel (University of California, Berkeley): Decolonizing Epistemic Racism/Sexism in Europe Today: “The Decolonial Perspective of Boaventura de Sousa Santos and Frantz Fanon in the Context of Decolonial European Struggles”. Round table: The state, academia and policy advice: better horizons? Closing keynote address: Pedro Bacelar de Vasconcelos (Universidade do Minho). CFP: ECAS 2013 "Revolution 3.0: iconographies of utopia in Africa and its diaspora"
Arterial Network will host its second annual conference on the African Creative Economy in Senegal. The conference dates are, November 14 -16, 2012. The aims of the conference are to provide practical analysis and reflective overview of the current status of African creative economy. This should help consolidate emergent African expertise in this area while providing critical thought necessary in navigating the unfolding realties the sector is faced with. While anyone is invited to submit such expressions of interest, preference will be given to African speakers who are based on the continent and who have the relevant expertise, experience or potential in these fields. Submissions are to be sent to Espera Donouvossi at Espera@arterialnetwork.org by August 25, 2012. O Crescimento Económico é Suficiente para Reduzir a Pobreza em África? O Banco Mundial lançou recentemente um novo relatório que revela que, após décadas de crescimento lento, África revela uma mudança significativa em termos de crescimento económico. Os países africanos têm realizado, na última década, reformas económicas com efeitos positivos: crescimento económico anual de cerca de cinco por cento, mais receitas comerciais, menos desequilíbrios macroeconómicos, mais consumo doméstico. Ao longo dos últimos 10 anos, seis dos dez países que registaram um crescimento económico mais rápido são africanos. Além disso, o Banco Mundial estima que a percentagem de pobres em África caiu de 58 por cento, em 1999, para 47,5 por cento, em 2008. Mas será que esse crescimento está realmente a contribuir para a redução da pobreza? Na primeira Kapuscinski Lecture em Portugal, organizada pelo Centro de Estudos sobre África e do Desenvolvimento (CEsA), Jan Vandemoortele, antigo director do PNUD e um dos autores dos Objectivos de Desenvolvimento do Milénio, irá questionar se o crescimento económico, a boa governação e a ajuda internacional são ou não suficientes para reduzir a pobreza em África. As Kapuscinski Lectures, inspiradas no jornalista polaco Ryszard Kapuscinski, são uma iniciativa do Programa das Nações Unidas para o Desenvolvimento (PNUD) financiadas pela Comissão Europeia. Na sua terceira edição, estas Lectures são um acontecimento singular, a nível europeu, para o debate sobre questões de Desenvolvimento global com especialistas de organizações internacionais, políticos, activistas da sociedade civil, empreendedores e académicos. 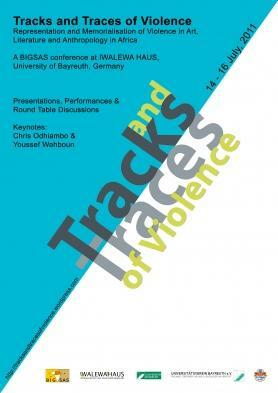 The BIGSAS conference ‚Tracks and Traces of Violence – Representation and Memorialisation of Violence in Africa in Art, Literature and Anthropology’ takes place at Iwalewa-House, the Africa Centre of the University of Bayreuth (Germany) from 14th – 16th July 2011. This conference zooms in on a specific phenomenon: violence. Cultural, social and individual medialization of lived experiences are often shaped and inspired by those violent events. Visual artists and writers from Africa have come to deal with these violent events of the recent past and the present. By means of artistic practice they, often as both representatives and witnesses, struggle to find ways to engage with the traumas and atrocities of conflict and war of post-colonial African states and attempts towards reconciliation. This conference discusses and explores tracks and traces of violence in – but not restrictively- artistic and literary practices as well as in anthropological works. The program of the 2011 Annual Conference of the Canadian Association of African Studies (CAAS), which will take place this May 5-7 at York University (Toronto), is now available through the conference website, as well as the CAAS website. A series of roundtables, planels, and papers specific to Luso-Africa and to Africa in Brazil appear therein,as follows. Federal Law 10639/03 and the Orientations for the Higher Education Level in Brazilian Universities – A New Paradigm? The Swahili Colloquium has become a well-established forum in Bayreuth. Every year, we invite scholars and researchers from different disciplines, who work on various aspects of the language and the respective culture(s) to this unique colloquium. The multidisciplinary approach and the wide range of contributions from linguistics, literary studies to anthropology and history particularly account for the appeal of the colloquium. We are always looking forward to welcoming you all including new participants at the Swahili Colloquium. like to suggest ‘Swahili and Modernity’ as a common point of discussion, this does not mean that we will not consider papers dealing with other topics, as the Swahili Colloquium tries not only to stimulate thematically-oriented interdisciplinary discussions, but also intends to provide a forum open to various contributions related to Swahili. We would like to ask you to give your paper either in Swahili or English. Each contribution will be granted 30 minutes (including ten minutes of discussion). Please register via email (to swahili@uni-bayreuth.de) and send us the title as well as a short abstract of your presentation till 30 March 2011. If your presentation is going to be in Swahili, we kindly ask you for a short English summary. Please also register if you merely intend to participate without giving a paper. We are looking forward to welcoming you at the 24th Swahili Colloquium in Bayreuth. Donald SIMPSON, Innovation Expedition, Africa - Here and There in the Sixties: A Canadian Perspective. Afrique Ici et ailleurs dans les années 1960: Une perspective canadienne. Dr. Mamdouh SHOUKRI, President and Vice-Chancellor of York University/ Recteur et Vice-chancelier de l’Université York. The Canadian Association of African Studies (CAAS) extends a special invitation to scholars and professionals working on all aspects of African Studies for its next annual conference. The conference, to be held on May 5-7, 2011, at York University - Université York, Toronto, Canada, will be hosted by the Harriet Tubman Institute for Research on the Global Migrations of African Peoples, York University, with the support of various internal and external sponsors. Our aim is to attract an international group of specialists at all stages in their careers to facilitate discussion and dialogue, in both of Canada’s official languages, across disciplines and between scholars and professionals based in both the North and South. In recognition of 2011 having been proclaimed by the United Nations General Assembly as the International Year for People of African Descent, the central theme of the 2011 annual conference of the Canadian Association of African Studies (CAAS) is Africa Here; Africa There. Africans have long peopled the African continent, as well as other landscapes through external migrations. During the modern era, the movement of African peoples has taken place under three major contexts: various trades in human beings, economic hardship emanating from natural and non-natural factors, and political, ethnic, religious and other types of persecution. Whether internal or external, the displacement of African peoples has always led to greater complexities within the host societies. Africans and people of African descent, free, freed or enslaved, made up a sizeable proportion of the population of Évora and Lisbon during the late 1400s and early 1500s and performed much of the most menial manual work while speaking various West and West-Central African languages and supplying characters and speech patterns to the works of contemporaneous playwrights like Gil Vicente. The same was true of London, not to mention other places in the United Kingdom, from at least the time of Shakespeare to the early 19th century. By the mid-1800s, their presence and influence was even more pervasive in Brazil, as well as Cuba. Similarly if Africans and the descendants of Africans attempted to recreate their homelands, imagined or not, amongst host societies, as was the case of the marooned Zanj in Iraq (869-883 A.D.), the great Bantu state of Palmares in XVIIth century Brazil, or later the Igbo in Maryland and Virginia, Jamaica, and Barbados, the process today is no less omnipresent as exemplified by the existence of Little Angola in Rio de Janeiro, Little Nigeria in Houston, or the current attempt to establish a Little Ethiopia in Toronto. In other words, Africa has long existed within the old continent and beyond as well. This reality, far from signifying solely an African presence, points to a series of new ways of moving across and exploiting space stemming from an evolving division of world labor, distribution of resources, and production of modes of living together. Africa Here; Africa There will explore, in English and in French, the multifaceted complexities generated by these phenomena within and outside of Africa over time from the perspective of various disciplines. The Canadian Association of African Studies (CAAS) contributes expertise, research, and informed debate concerning a wide range of African “matter” related to sociocultural issues, the arts, political economy, the environment and transnationalism, among others. Since 1970,CAAS has demonstrated how African issues matter to a wider range of Canadian and international publics in academic, policy-making, programming, and many other circles. The expanding recognition of African contexts and initiatives to a growing range of transnational practices (from humanitarianism to peace building; markets to social movements; climate change to food security; religious dynamism to health and education policies; sports to music, theatre and cinema; truth and reconciliation processes, migration and diasporas to the forging of the world) has meant the continent is taking on a greater prominence in the attention, imagination, and actions of more and more publics. We also encourage the submission, whether in English or in French, of research papers in these and other areas. In the last forty years, like many other Northern nations, Canada has had expanding and diverse relations with Africa. African immigration to Canada has increased not only through the regular immigration of professionals and others, but also, importantly, through refugees fleeing from conflicts in areas such as Uganda (1972), Somalia (since 1991), and Algeria (since 1992). In turn, a growing number of Canadians have been to Africa through an expansion of humanitarian and international development activities by Canadian governmental and non-governmental organizations, business activities, particularly in natural resources sectors, university exchanges, and tourism. Solidarity work by Canadian individuals and groups also increased during this period, from working with national liberation groups to supporting human rights agendas, from advocating for women rights to addressing health and environmental conditions. Canadian governments have been preoccupied with African matters through international bodies such the Commonwealth, la Francophonie, the United Nations, and G-8 summits playing a visible part during the anti-apartheid struggle, peacekeeping and peace building activities, and supporting NEPAD (New Partnership for Africa’s Development), to name but a few. The growing number of Canadians of African birth and descent have not only played important roles in such exchanges and ties but also helped to introduce or expand new consumption patterns and artistic practices in Canada(in food, clothes, music, film, literature, and the like) and new forms of religiosity and congregations. At the same time, there have been some tensions emerging in Canada-African relations such as: the tightening of visas on African visitors coming to Canada in the name of security and to limit refugee claims; a reduction in the number of Canadian peacekeepers in Africa; a recent reduction in number of African priority countries for CIDA; protests over labor practices and engagement against corrupt practices; and, limited African beneficiaries of Canadian direct foreign investment in Africa. The above issues help to highlight key concerns and demonstrate why there is growing interest in Africa in Canada. However, there is a vast array of topics of interest in African Studies beyond these issues, as well, that would be welcomed to be presented at this conference. From examining wide-reaching events such as the slave-trades, the HIV/AIDS pandemic, and current conflicts to the minutia of everyday life such as schooling practices, religious invocations, and media consumption, Africa Here; Africa There will provide an opportunity for the sharing of research and debate concerning the study of these issues in both English and French. matters, this conference welcomes papers on a wide range of topics concerning Africa and African peoples abroad from a variety of disciplinary and interdisciplinary approaches. In keeping with the bilingual nature of CAAS and the encouragement of bilingual study at York University, paper and panel proposals in French are particularly welcomed. Africa Here; Africa There aims to continue the CAAS tradition that exemplifies why Africa matters to various publics in Canada and beyond. This Call for Papers intends to provide a forum for addressing and presenting academic research and policy proposals that examine the histories, debates, policy issues, and current practices related to African matters.